Web design / development and multimedia creations, plus the occasional blog, from the brain and fingers of Luc Pestille. Greetings program. Welcome to the 9th (I think) incarnation of Project 14 - my corner of the internet where I fail to regularly update my portfolio, blog once a year, and re-design every 18 months. I know, I know. Maybe I can help you out instead? 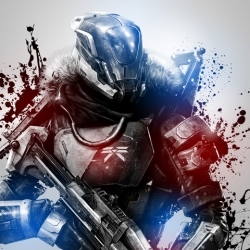 Destiny Wallpapers - Warlock, Hunter or Titan? Some lunchtime reddit browsing lead me to a nice PhotoShop job on some Destiny artwork - unfortunately the original author had only created a Warlock version, and my creative OCD and want for karma lead me to create versions for the other classes, with my twist on the technique.